Lorien came to me with a beautiful Italian silk gown from J.Crew. This J.Crew gown that was so popular that a year after they discontinued it, they reintroduced it, only to sell out of it in no time at all. This gown is very well suited to "redesign"; one can really do so much with one of these gowns. 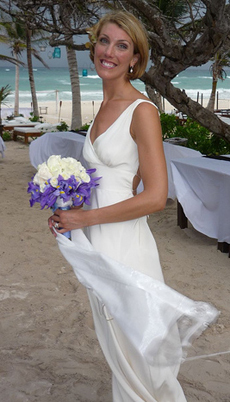 Lorien was having a beach wedding and wanted the dress, which originally had a full back, to be backless. She wanted the remaining "halter" to be lighter than the original cut as well. The first challenge was fitting the loops and ties to secure the dress. Then came the real challenge which was lowering the back of the bias cut skirt and setting it in again to fit Lorien’s slim figure without losing any of the skirt’s fullness, length or drape. It took a good deal of patience on Lorien’s part, standing for me while I basted, and in the end, I’d say she was one happy bride! "Julie is incredible! She took my $70 dress from J.Crew and turned it into a one of a kind, just-my-style, never to be duplicated masterpiece. Not only is she kind, but she is also an artist, a perfectionist and a professional! I am so appreciative of her work and her innovation. I would recommend her over and over again to anyone interested in altering their wedding dress. Thanks Julie for turning my simple dress into a work of art."